These relatives of daffodils are sweetly scented, tiny and delicate. To paint them, I've use a mixture of thin washes in the shadows and thick brushwork where the morning sun highlights them giving this painting an impressionist look. 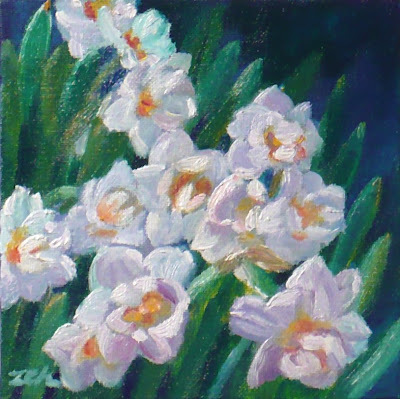 This painting is sold, but you may view my other artwork for sale at Zeh Original Art Etsy shop. Thanks for stopping by.